Safely tied alongside in a spider’s web! Yesterday we sailed out of the bay to a small atoll and the humans entertained themselves snorkelling while I chilled out under the dinghy. I love my spot there because when the humans come back aboard I can spy on them through the hatch without them knowing I’m there! 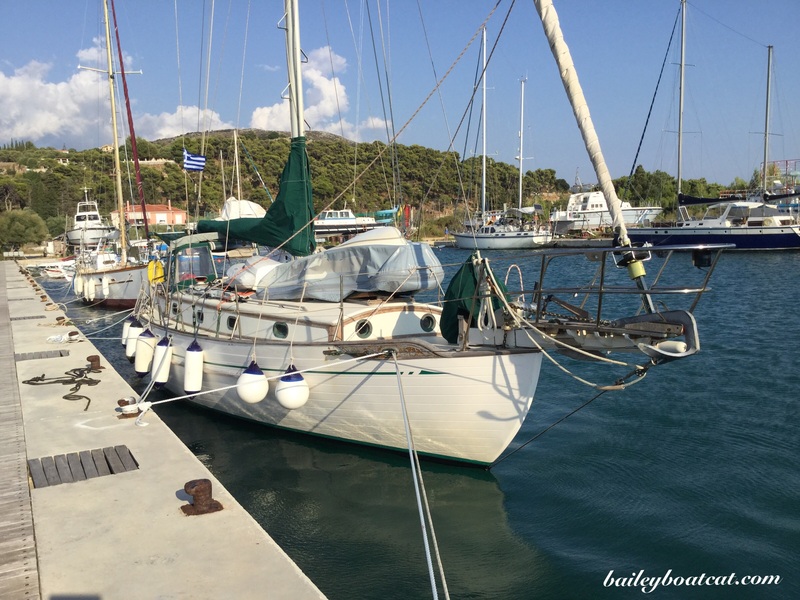 We anchored last night and then this morning we made our way into the disused marina which will be our home for the next week. Since mum and I will be here on our own while dad goes back to Rome for work, he’s made sure we aren’t going to budge…Nocturne is safely stuck in a strong spider’s web of lines! It’s such a strange little place here that we’re staying in for FREE! I can’t wait to explore and tell you more about it. 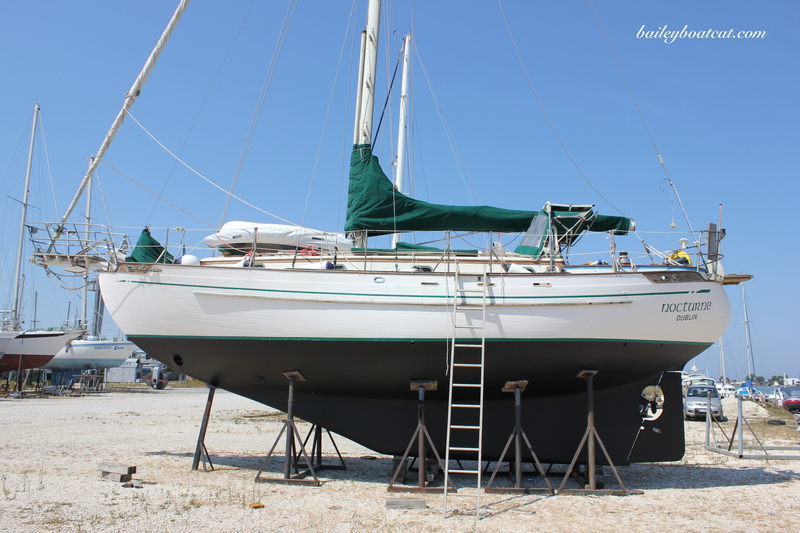 There’s no electricity or water, but we have lots of water in our tanks and we can run the engine and use the inverter for power aboard when we need to, so we’ll be just fine here! Have a wonderful week exploring, be safe. That sounds like a very snug nest for the next week, Bailey! I know you maintain a good watch over your mom! Great place to spy on the humans! Being inside a spider web sounds….safe…. I think you and your mom will be fine. Wish we could all be having a free week in such a pretty place. You are a lucky cat! 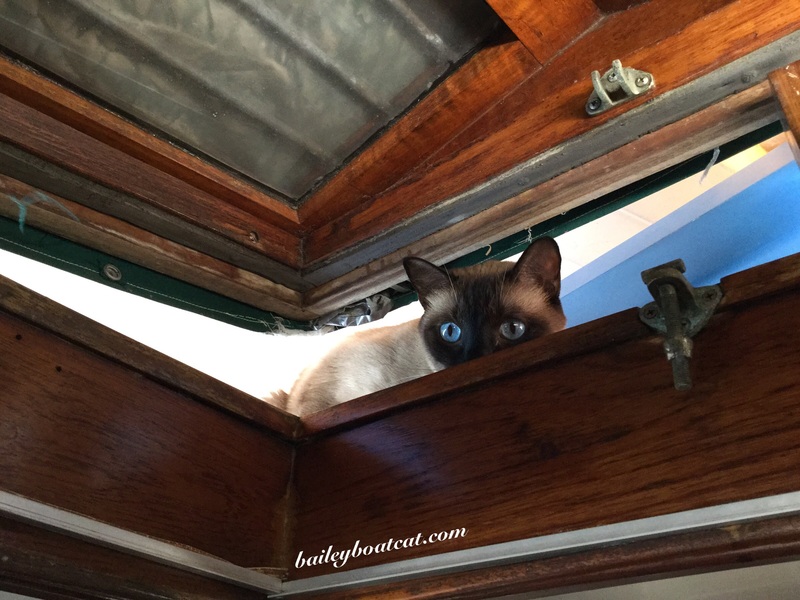 Ha what a great post and blog… Love the sneaky view… Our cat ivy does the same it’s like hide and seek.. I spy with my little eye! Bailey you are so cute. Have a nice week in the marina & be careful with your explorations. This does sound like an interesting place – can’t wait for photos! We are glad the spider web is just ropes and not a real web. Please be careful! Beautiful photos!